Although nuclear fusion could be many years away from powering homes across Canada, you can own its equivalent in four-door sedan form: the 2019 Ford Fusion. This svelte mid-sized car, adorned with a wide slatted grille, aggressive headlights, and a range of sporty aluminum rims from 17 to 19 inches, is the future of the family car. And once you take one for a test drive, you’ll want it to make it your future vehicle as soon as possible. 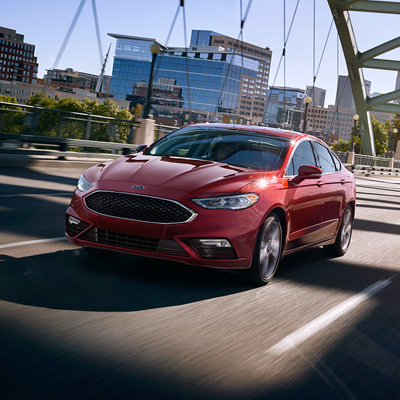 The 2019 Ford Fusion is available in eight models: from the excellent value Fusion S to the luxurious and economical Fusion Hybrid Titanium. Want to see what we have in stock? Discovery Ford dealership in Humboldt (and within quick driving distance from Humboldt, Bruno, Prud’ Homme, Sagehill, Saint Benedict, Middle Lake, Pilger, Fulda, Marysburg, Muenster, Saint Gregor, LeRoy, Englefeld, or Lake Lenore Saskatchewan) is your best bet for finding your ideal new or used certified car. Just browse our Ford Fusion inventory you can filter it by price, kilometers, colour, and year it’s that easy! In addition to the high-tech SYNC with MyFord Touch infotainment system, you can set the mood in your 2019 Ford Fusion with available ambient interior lighting in your choice of seven colours: Ice Blue, Orange, Soft Blue, Red, Green, Blue, or Purple. Every drive through town and down the highway will be relaxing in the 2019 Ford Fusion because all cabin surfaces are swathed in premium, soft-touch materials like an available leather-wrapped steering wheel, shift knob, and heated sport seats. So why not blast your favourite jams over Bluetooth and see where the road takes you; let’s make driving fun again! So you say you want a Ford Fusion, but which one? This handsome sedan can be specified in five engine configurations. It’s a little overwhelming at first, but we’re here to explain their respective power figures and fuel efficiency so you that you can make the most informed vehicle purchasing decision. If we had to pick one new Ford vehicle technology that our customers most often request, it would be a rear view camera. Whether it’s a sports car, pickup truck, SUV, or family sedan, it’s a wonderful feature that projects a high-resolution video feed of what’s directly behind your car onto your centre console screen. Best of all, it’s standard on all 2019 Ford Fusion models. Now you can reverse out of your driveway or back up onto your garage without fear of running over your kid’s bike or smashing your bumper. The rear view camera in the 2019 Ford Fusion is indeed a life (or bumper saver). It even features a proximity sensor to let you know how much room you have left before striking an obstruction. If your new 2019 Ford Fusion has to pull double duty as a hauler of home renovation and garden supplies, its cavernous, 453-litre trunk is more than capable. However we would recommend picking up a set of rubber floor mats and a rear cargo tray to protect those nice carpets. Discovery Ford in Humboldt, SK has a huge warehouse of Genuine Ford Fusion parts and accessories. Just fill out a parts request form or visit our friendly advisors to outfit your vehicle today.